Serves 4 – 6 adjust quantities for larger groups. Thanks to Nelson Bernardes for the recipe. Method: Steep sliced lemon rounds in the first 3 ingredients overnight. 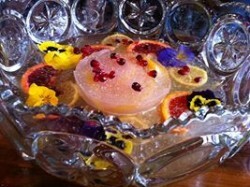 Pour into punch bowl filled with ice and add champagne just before service. Method: Heat ingredients in a pan. Simmer for 20 minutes then strain the hops out and serve with satsuma slices and a stick of cinnamon to garnish. Method: Mix all ingredients in a saucepan and place on the heat. Let the concoction simmer for 20 to 30 minutes. Taste, adding lemon or honey depending on whether you prefer sweet or sour. When it’s ready, pour into a teapot and serve in teacups or alternatively in a traditional punch bowl. This punch can be reheated should you wish to prepare it prior to a gathering. 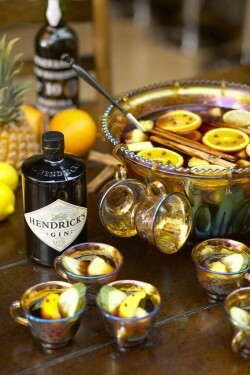 This punch is best simmered for half an hour or more– allowing the pineapple time to soften and caramalise. Pineapples (one of the most exotic ingredients one could get hold of) would have been a real treat during the Victorian Era, making this punch a genuine celebration. This one is slightly more complicated as it requires a bit of prepping but you will certainly wow your guests with it. Method: Make a rich syrup by combining Demerara sugar and 2 cups water over medium-low heat, whisking until sugar is completely dissolved. Let cool. Add pineapple cubes to the syrup and cover. Let soak overnight at room temperature. Strain the pineapple from the flavoured syrup (don’t discard the fruit—it’s tasty). Use a sharp vegetable peeler or paring knife to remove the zest from three lemons; avoid the bitter white pith. Place the zest in a bowl and add the superfine sugar. Mash with a wooden muddler until the mixture is fragrant and the lemon oil combines with the sugar to make a thick paste. Let rest one hour, and then remove the bits of peel (or leave them in as garnish). Method: Add all the ingredients into a cocktail shaker (except the Champagne) and shake really well with plenty of cubed ice. Using a fine tea strainer, strain the resulting cocktail into a chilled coupette glass and top up with a splash of Champagne. Garnish with an edible flower. Enjoy! * For the orange & grapefruit sherbet, grate the peel of one orange and two pink grapefruits then stir the resulting grated peel with 150g of caster sugar for around a minute or so to extract the natural oils out of the citrus fruit. Next, squeeze all the juice out from the orange and also the juice from one of the grapefruits and add to the sugar mixture. Stir this continually until the sugar has dissolved fully. 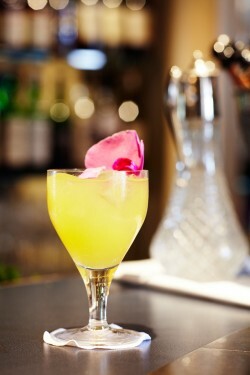 Pass the liquid through a fine strainer and it’s ready to use – 30ml per cocktail. ** For the Earl Grey tea infusion, brew one Earl Grey tea bag in 150ml of boiling water then take out after 4 minutes. Leave to cool then use 30ml per cocktail. And check out our Cocktails section for more great festive drinking ideas.